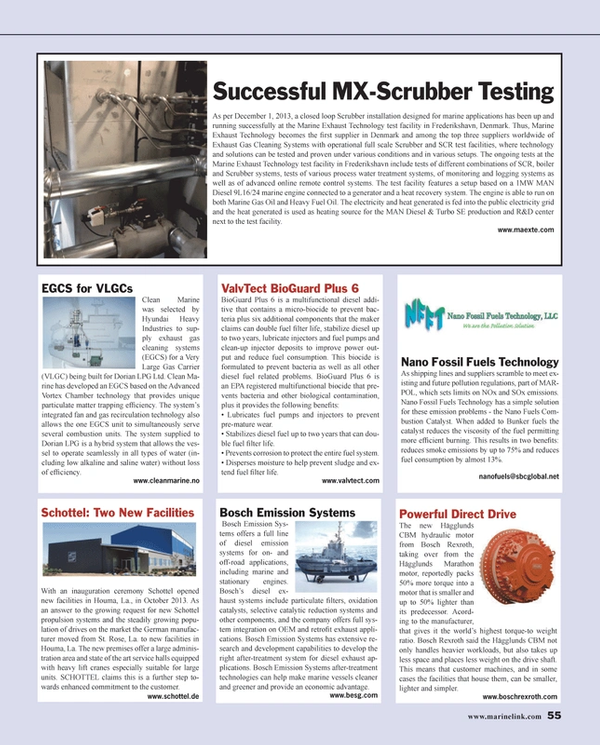 As per December 1, 2013, a closed loop Scrubber installation designed for marine applications has been up and running successfully at the Marine Exhaust Technology test facility in Frederikshavn, Denmark. Thus, Marine Exhaust Technology becomes the first supplier in Denmark and among the top three suppliers worldwide of Exhaust Gas Cleaning Systems with operational full scale Scrubber and SCR test facilities, where technology and solutions can be tested and proven under various conditions and in various setups. The ongoing tests at the Marine Exhaust Technology test facility in Frederikshavn include tests of different combinations of SCR, boiler and Scrubber systems, tests of various process water treatment systems, of monitoring and logging systems as well as of advanced online remote control systems. The test facility features a setup based on a 1MW MAN Diesel 9L16/24 marine engine connected to a generator and a heat recovery system. The engine is able to run on both Marine Gas Oil and Heavy Fuel Oil. The electricity and heat generated is fed into the public electricity grid and the heat generated is used as heating source for the MAN Diesel & Turbo SE production and R&D center next to the test facility.